Clever storage solutions can help your family make the most of your space and keep unsightly clutter out of sight. We recently installed a project for a family with three kids all under the age of 5, including a newborn. Needless to say they needed practical decor with a lot of kid-friendly storage options! One room that we helped the family ‘tame the chaos’ was in the home’s front entry that opens up to the family room and dining area. The space needed plenty of options to hide away all the kid-essentials. We incorporated a chest with plenty of drawers for storage for the main entry piece. Then we placed a console with open shelving behind the sofa. 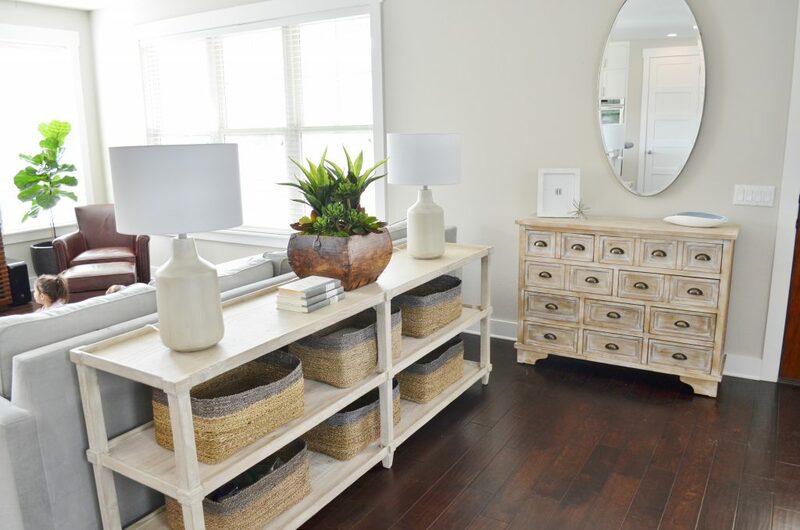 The shelves of the console allowed us to add baskets so that even more clutter could be hidden. The large baskets keep the console tidy, neat, and visually attractive. 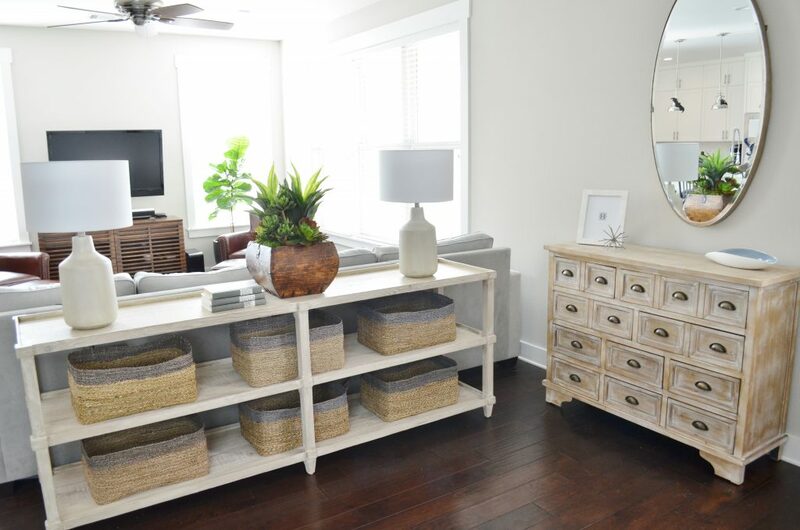 We selected baskets with a pretty grey trim to keep with the home’s transitional motif. You would hardly know that toys and other essentials are hidden away. 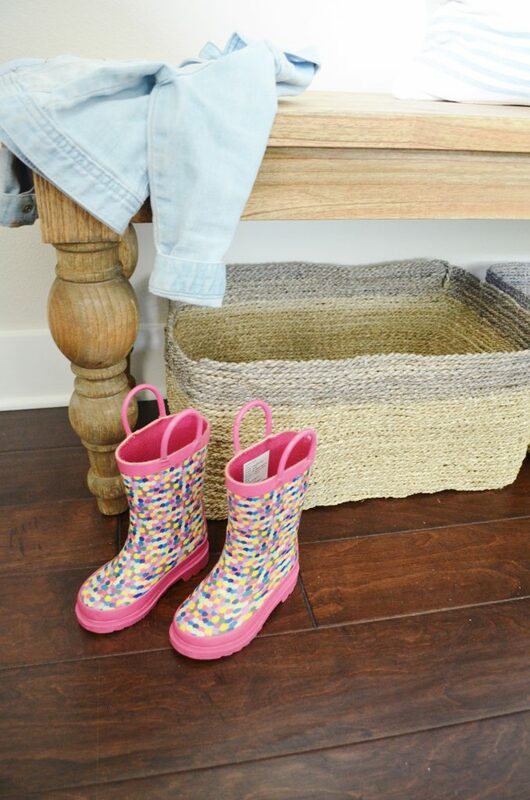 We especially love this idea because as the family grows they can keep the baskets or style the shelves with something different. Either way it is a practical, livable staple for the family. 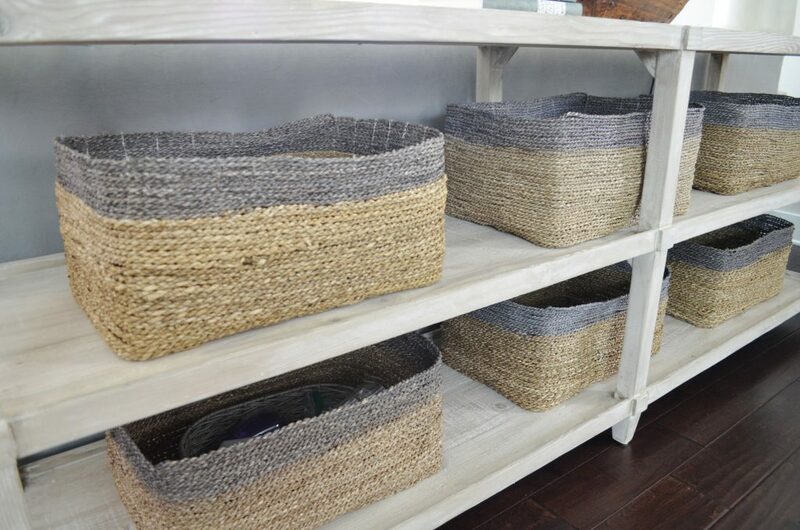 If you want to add baskets to your existing shelves, be sure to measure. Try to get the tallest and deepest option your shelves can handle so that you can really optimize storage. 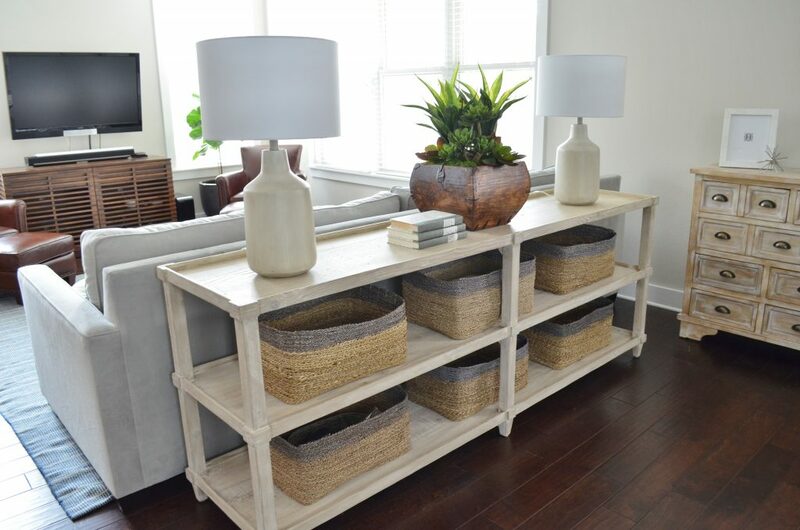 Just across from the open shelf console, we added a statement art piece and bench with even more baskets for storage! 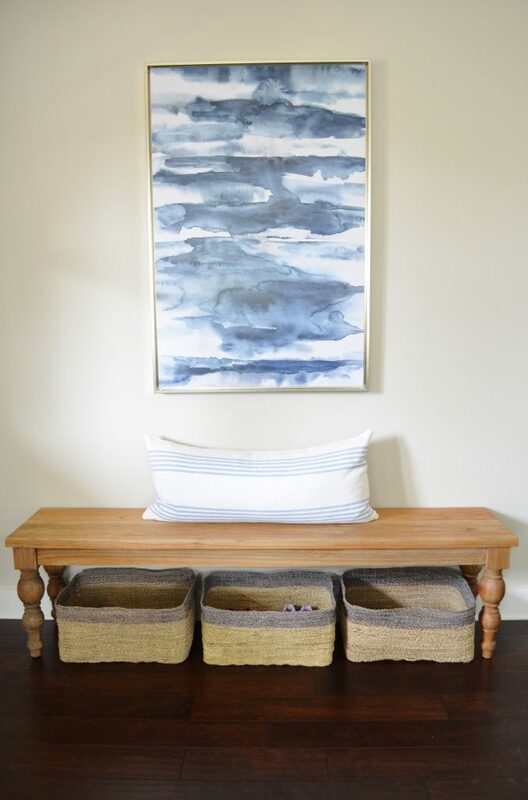 We love the option of a bench with baskets because it solves the problem of where to put shoes. This is a fantastic storage solution, especially if you like your family and guests to be shoe-free. 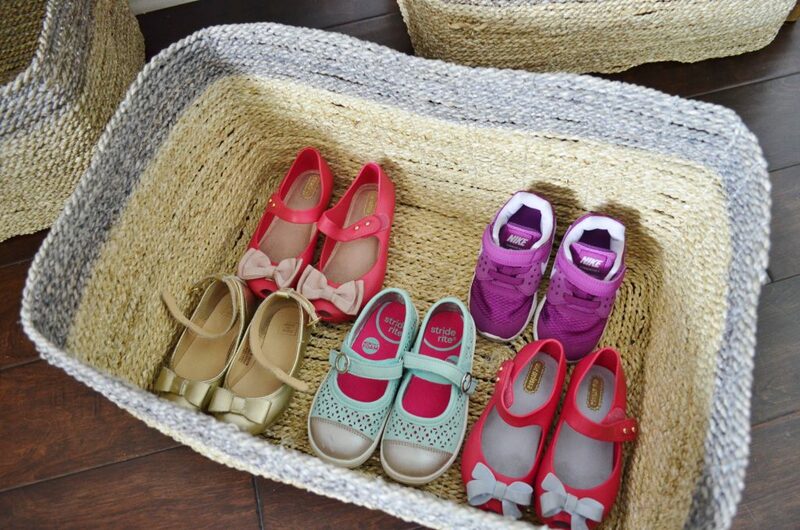 These baskets organize the kid’s tiny shoes like a dream and will work just the same as they grow older. If you need some design help to get your home organized, our team can give you stylish and livable solutions. Click the link to our design questionnaire here and your plans for a clean and organized home could be right around the corner. Love some clever storage! Always on the look out to find new, creative ideas, love this one too!